Jacksonville State University’s Flying Blind Theatre Ensemble is taking its original comedic production of “The Country Co-ed” straight to the nation’s capital. “It’s a real feather in the cap for us, the drama department and JSU at large,” said lead playwright, cast member and JSU Drama Professor Dr. Michael Boynton. The troupe is set to perform a four-day stint in the Cap Fringe Festival. The two-hour performances of the production, which is suitable for adults only, are set for July 25-29 at the Blind Whino: Turquoise in Washington, DC. 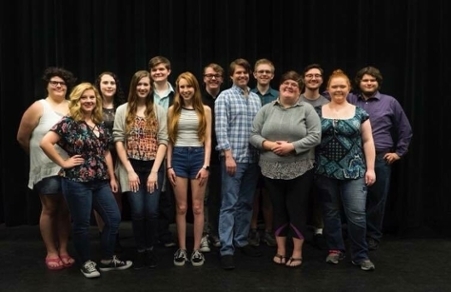 JSU Drama students collaborated to create, produce and perform a reading of “The Country Co-ed,” which is loosely based on William Wycherley’s Restoration Comedy “The Country Wife” from the late-1600s, during the spring 2018 semester. “This production is a unique product of my Special Topics in Performance course on Devised Theatre, where myself and the students created a new original work as a collaborative team,” Boynton said. Boynton is especially proud of his student’s and fellow FBTE company member’s work. The cast and crew include Anastasia Barker, Chloe Barnes, Boynton, Colton Cram, Sam Eddy, Ansley Gayton, Jessika Holmes, John Mackey, Larry Mason, Meghan Browning Phelps, Alexis Robinson, Catie Stahlkuppe, Shauna Steward, Eric Wilkerson, Aaron Williams, Dakota Yarbrough, Brooke Elam and Ebony Antoine. Tickets are $17 and are available online up to two hours before each performance. Tickets can also be purchased at the venue up to 45 minutes before each show. You must also purchase a Capital Fringe Festival button to gain entrance into the show. To purchase tickets or read more about this production, visit the Capital Fringe website. To learn more about the Flying Blind Theatre Ensemble, visit their website. To make donations to and help support this newly formed theatre company, visit the FBTE donation page to make a tax-deductible donation through the JSU Foundation.